As a child there was something frustrating about cartoons featuring characters either mute like the Pink Panther or, like Charlie Brown’s horn-throated parents, intentionally incoherent. A world in which people didn’t speak seemed inherently scary. How could you communicate? How could you know what you needed to know? How could misunderstandings become understandings? How could you find or keep friends? How could you ever experience anything but crushing loneliness? 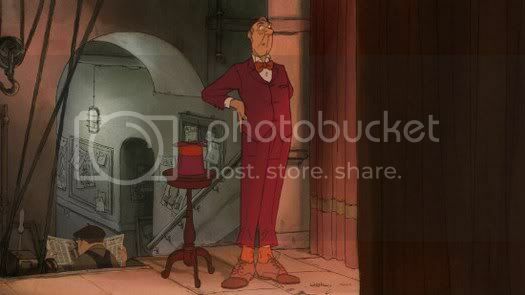 A sense of disconnection is perhaps why the characters of Sylvain Chomet’s The Illusionist speak rarely and, when they do, only allow a coherent word or two to squeak through otherwise garbled speech. The film’s main character, a French magician, finds himself more and more disconnected from a world that once warmly received his brand of entertainment. The film follows the final days of the magician’s career. He travels through the great cities of Europe plying his trade, but finds himself squeezed out of the limelight by the increasing appeal of fledgling rock ‘n’ roll. His greatest success is in a tiny Scottish town so backward that the switching on of a light bulb is met with thunderous applause. Yet even there, moments after the magician’s well-received performance in the crowded pub, he is replaced with a jukebox. While in the town, the magician impresses the young Alice with his magic. Hiding in the back of a truck, she follows him when he leaves the town and convinces him to go to Edinburgh where they stay in a hotel filled with clowns, ventriloquists and acrobats who – like the magician – have been left behind by the world’s shifting tastes. There is a sweet, innocent romance between Alice and the magician, but they never exchange more than a peck on the cheek. The animation is beautiful and each character – even those who simply fill the background – is distinct, recognizable, and expressive even without the gift of speech. The film thoughtfully plays with the notion of whether or not, like the magician’s illusions, we are always seeing what we think we’re seeing; like when a windblown cloud of feathers fools Alice into thinking it’s snowing or a pair of oncoming headlights make the magician and Alice think they’re not long for this world until, instead of a car, the headlights prove to be from twin motorcycles. While the film certainly ends on a sad note, it’s filled with wonderful comedy that seems utterly human even in its sillier moments. One of my favorite characters was the drunken, warmhearted Scotsman who seems to pop up unexpected everywhere; ready to dance wildly like a frat boy in a mosh pit to his pub’s new jukebox, or to abruptly drop face-down in the grass and roll down a hill like a little boy. The humor never seems cruel even in its darker moments – such as the many trials and tribulations of the suicidal clown who lives upstairs from Alice and the magician – and you leave with the impression that the filmmakers cared thoroughly for every single one of their cartoon creations. I am thankful that growing up has, among other things, cured me of my aversion to such animated features. I found it very refreshing to experience a film whose characters communicate mostly without words, as well as simply watching a film that explored a genuinely different way of telling a story.